With your home’s Wi-Fi connection, you can control this thermostat from anywhere in the house. Or with the Total Connect Comfort app, you can monitor or control your heating and cooling system with your smartphone from anywhere and anytime you choose. 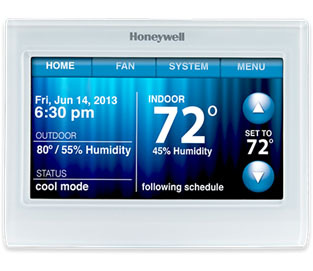 Back home, you’ll like the look of the thermostat’s colorful, high-definition touch screen. Change the color to any you wish. Simple programming and touch-screen input make the Wi-Fi 9000 thermostat easy to set up and intuitive to use. Next post: A yearly furnace inspection will prolong the life of your HVAC system and save on your energy bills.